Even after having gone through the intellectual rigours of philosophy and theology at seminary, Bishop Lazi still doesn't fancy the nature versus nurture debate. But there is a particularly inexplicable and curious phenomenon that has piqued my intellectual interest, where human beings, particularly those who share the same societal environs, are nurtured in pretty much the same way as if they are the fruits of the same loins. Perhaps this might help explain why a journo in Harare is as scruffiest, rancorous and whiskey-loving as you would find in a scribe in Washington or Beijing. It is the same for those weirdos that we call doctors, at least most of them. They always seem tranced and entrapped in a parallel geeky universe that they only can make sense of. If you think that Bishop Lazarus is making this stuff up, the next time you visit your doctor take time to study their behaviour: I bet you will definitely notice some settling or unsettling idiosyncrasies. Human beings, as creatures of habit, are the same everywhere and anywhere, which makes it easier and simpler to characterise and stereotype them. Of course, with few exceptions such as this Bishop, it seems in this part of the Savannah, we don't invest much intellectual effort to understand human behaviour and the world around us. Some academics claim that this is simply because unlike societies such as China — which has had an unbroken civilisation for more than 5 000 years — African societies' indigenous knowledge systems were disturbed by intrusive phenomena such as the 15th century transatlantic slave trade and the subsequent 19th century imperialism. This is why, it seems, we are happy to parrot and harp about world views, philosophies, sciences and concepts that were, and are, developed in Western capitals. Don't we have our own philosophers of intellectual heft? The Western world and its institutions as we know it today was seemingly hammered out from the anvil of Greek philosophical thought. In fact, democracy — in its earlier form as "demokratia" — was first conceived in Greece. Also, the work of the Greek philosophers such as Aristotle, Plato and Socrates have been quite influential and pervasive in the way we interpret political philosophy, ethics, metaphysics, ontology (the study of the nature of being, becoming, existence, or reality), logic, biology, rhetoric, and aesthetics (branch of philosophy dealing with art, beauty, and taste) today. But you might ask, why is Bishop Lazi unloading all this "balderdash" on you? Well, understanding the world is the first step to shaping, reshaping and changing it. Greek philosopher Plato, who was born circa 427 BC, developed the Platonic method, which challenges people to question age-old truths and develop new ideas and concepts that break with tradition. It is through the Platonic method — which is encapsulated in some of Pluto's work such as "The Republic" — that we are able to decipher riddles and puzzles such as the chicken-and-egg conundrum and the nature versus nurture debate. All told, philosophers simply encourage us to think and reason. To some demonstrable extent, the Platonic method can be used to try and understand the behavioural science of a fascinating group of learned creatures that we call lawyers. If anyone asks you about what is wrong with Zimbabwe today, just point at the nearest lawyer, especially the egoistic ones. And Zimbabwe is teeming with this lot. As the saying goes: if you throw a stone in Washington, you are likely to hit a p*edophile or pervert, but if you throw a stone in Harare, you are likely to hit a lawyer. Dear reader, nothing is as insufferable as a lawyer who thinks they know everything and anything under the sun. It's bad enough dealing with one of them, but if they morph into a political outfit, you sure as hell have a crisis on your hands. Even after offloading Obert Gutu and Jessie Majome, the MDC-Alliance still remains an asylum for lawyers — Nelson Chamisa (lawyer), Douglas Mwonzora (lawyer), Tendai Biti (lawyer) and Welshman Ncube (lawyer). The list goes on. Their most avid cheerleaders, as personified by Alex Magaisa — who routinely dishes out doughy pieces of insidious opposition propaganda to an ever-dwindling handful of followers — are also lawyers. Well, the Bishop is willing to endure the rigmarole of the UK-based law lecturer's rumbling pieces for as long as they are on law, but not any other dross that is disguised as op-ed' s on economic issues. But even Magaisa cannot even hold the candle for Tendai Biti. Clearly, they don't quite make them like this fine gentleman, whose thought process is as fuzzy and inscrutable as his dress sense. You ask Biti a question on any subject, he happily bats away. The chap will have us believe that he is the best thing ever to happen to the Ministry of Finance. He has even grown more desperate after the appointment of Prof Mthuli Ncube as Treasury chief last year. But Galatians 6: 2-6 counsels: "Carry each other's burdens, and in this way you will fulfil the law of Christ. If anyone thinks they are something when they are not, they deceive themselves. Each one should test their own actions. Then they can take pride in themselves alone, without comparing themselves to someone else, for each one should carry their own load." Isiah 2:12 is even more emphatic: "The Lord Almighty has a day in store for all the proud and lofty, for all that is exalted (and they will be humbled." In the old days, Biti would purportedly make economic commentary — often fulminatingly delivered with high-sounding hyperbole and platitudes — and the excitable hoi polloi would deliriously cheer him on, but now as real economists step out of the shadows, he is slowly being exposed. On October 31 last year, the garrulous parliamentarian had a painful reality check. "Honourable Minister (Prof Mthuli Ncube), for all intents and purposes, the country is in a recession. Therefore, introducing a tax and one that is so retrogressive . . . The question is that why is the Government imposing this additional transaction tax when we are in a recession?" he asked the current Treasury chief. To which Prof Ncube answered: "Honourable Speaker, it is also not correct to argue that the economy is in a recession. The economy is not in a recession. There is a technical definition of recession which is two successive quarters at least of negative economic growth. I submit that we have not had two successive quarters of negative economic growth, neither do we expect future growth to be negative. On the contrary, we have increased our projection of economic growth to the order of 6 percent." You should have seen how the Biti slunk away from mic and collapsed into an embarrassed heap on those suave, green leather sofas. On February 25 this year, during a live radio programme by one of the private radio stations to discuss the Monetary Policy Statement, Biti reckoned that Professor Ashok Chakravarti — his co-studio guest — was a soft target. Obviously aware of his own fuzzy appreciation of economic issues, the straw man tried to use his legal expertise as stilts to support his attack on the Reserve Bank of Zimbabwe (RBZ) Governor Dr John Mangudya's decision to float the exchange rate. He talked about "Grisham's Law", "fiat money", "voodoo economics", "feja- feja economics" and "casino economics" as he painstakingly tried to trash "bond notes" and "electronic money", which he effectively referred as "fake currency" and "hot air". He tried to crucify Mangudya for not providing the funds that could be traded on the interbank forex market. But again, Biti had to endure the ignominy of another economic lecture from the Prof on the essence of fiat money and the mechanics of the interbank foreign exchange market that has been introduced by Mangudya. The fact that people are trading bond notes and electronic money on the parallel market, Prof Chakravarti pointed out, shows that there is inherent value in the bond notes and electronic money. 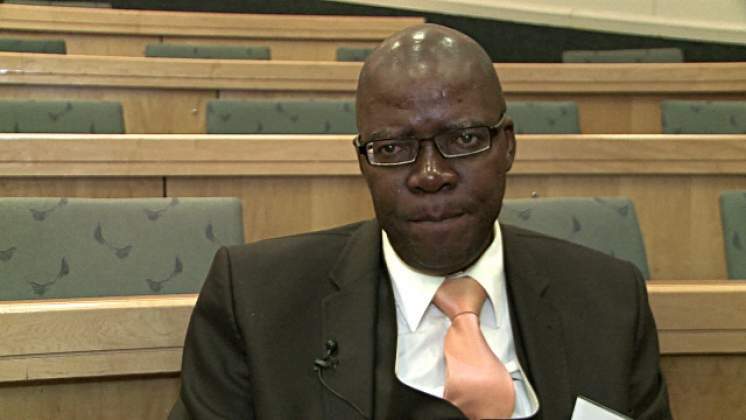 Sensing further embarrassment, Biti tried to drown out the Professor by interjecting, but the man persisted. He told the economics wannabe that the interbank market is actually sustained by private sellers of forex, and not the RBZ. It was yet another humbling episode. And then the coup de grace came from the most unlikely source — the central bank chief himself. After hauling Mangudya (last week) before Parliamentary Portfolio Committee on Public Accounts, as chair, Biti — knowing full well that eloquence was not the Governor's strongest suits — sought to embarrass his guest in order salvage his was own waning reputation. Bizarrely, he asked Mangudya to apologise for allowing Government to borrow money without seeking approval from Parliament. Obviously, the lawyer had not budgeted — no pun intended — for what was to come as the tables were turned. "Let us not forget history. When you were Minister of Finance — I have got the files — the loans that you also contracted according to the RBZ Act, such loans they never went to Parliament and today to tell me that . . . I will tell you one loan that we did myself (as then CBZ Bank chief executive officer), yourself and the former Prime Minister of the country." Came the humbling response, and his stilts and props came crashing down. Characteristically, Biti tried to drown him out by haranguing him, but the horse had long bolted. Not surprisingly, he now has retreated to the enclave of social media, where he tries to inflate his reputation to his impressionable, financially illiterate followers. How times have changed. But Bishop Lazi, however, is a fair man. You have to give it to him: admittedly, the guy is a good lawyer, but he should stick to his lane. It is a stark reminder to all those lawyers who variously make efforts to masquerade as journalists, economists and experts in fields they ordinarily didn't train to do. Life will definitely humble them. If they were that good at their own jobs, our prisons wouldn't have been brimful with disgruntled convicts, most of who feel hard done by them.